Gather ’round, stuntmen trainees, adrenaline junkies, and X Games fanatics: SPIL Games has released an iPhone app called Uphill Rush 2 for all your 2D stunt-race gaming needs. There are plenty of options, as you can challenge yourself to win eight cups in three different worlds using 12 customizable stunt vehicles and 20 different racing outfits. There are three levels and two game modes to play in: Easy, Medium, and Hard; Time Trial and Versus, respectively. Unfortunately, all but the most basic of vehicles and levels are locked until you gather enough coins (Mario Kart-style) or complete the previous levels (better vehicles are faster, of course…and they look better). To go along with the many customizations, there are many ways to manipulate the vehicle. 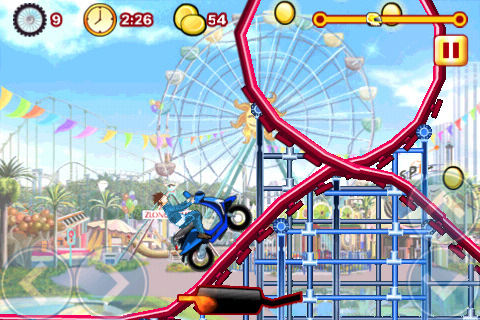 There are the basic accelerate and brake buttons, but there are also stunt maneuvers that you can perform by tapping the screen or shaking the iPhone while the character is in midair. (See the How to Play to get an fuller idea of all the options). Seeing the stunts done on-screen is exciting–but be careful not to over-do it, because seeing your character smash into railings is not. Seeing your character just full-on eat it on-screen can elicit a few winces, that’s for sure. Uphill Rush 2 is a great game that is pretty accurately named–you will probably get a rush going through the levels of this game and trying not to smash and burn. It’s a simple concept to play with, but can get pretty tricky as you add in all the extra stunts that’ll get you major bonus points. No two rounds will be the same, as you can play different stunts at the same areas (especially when you’re getting a feel for the game). As a minor quibble, an option to exit to the main menus would be helpful. But overall, Uphill Rush 2 is a great app that is fairly engrossing, especially for only $0.99. AppSafari review of Uphill Rush 2 was written by Julie Guan on March 17th, 2010 and categorized under App Store, Fun, Games, Physics Based, Racing, Sports. Page viewed 5425 times, 1 so far today. Need help on using these apps? Please read the Help Page.